A man suspected of helping to smuggle arms from Iran across the border for the Taliban in Afghanistan has been detained, Nato officials say. A statement described him as a "key Taliban weapons facilitator". 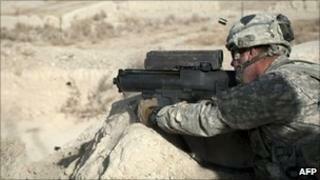 The man was caught last Saturday in southern Kandahar province - the current focus of Nato offensives. However, Nato has clarified that he is not a member of the elite al-Quds force of Iran's Revolutionary Guards as suggested by its initial reports. Preliminary intelligence reports led the Nato-led International Security Assistance Force (Isaf) to believe he was a member of the force, but after gathering more information, it was determined that while the individual may be affiliated with several insurgent-related organisations, he is not a member of the al-Quds group." The man was held in the Zheri district of Kandahar, a province known as the birthplace of the Taliban movement. He "was considered a Kandahar-based weapons facilitator with direct ties to other Taliban leaders in the province," the Isaf statement added. A senior Afghan security official in Kandahar said coalition forces had been monitoring the man for some time. He told the BBC: "Iranian intelligence officers are helping the Taliban and drug dealers in the south. We deal with it every day. This is a known fact now. "It was the international forces who arrested him. They had been listening to him for some time and monitoring his electronic communications." The BBC's Bilal Sarwary, in Kabul, says the Iranians are widely suspected of having supplied the Taliban in south and south-western Afghanistan with roadside bombs and other weapons. Afghan intelligence officials privately suspect Iranian intelligence of meddling, our correspondent says, but are sensitive about making the accusation publicly. Landlocked Afghanistan's reliance on its western neighbour was highlighted on Thursday when Iran - without any explanation - stopped fuel supplies from going over the border. A source from the Afghan domestic intelligence agency, the National Directorate of Security, told the BBC some of Afghanistan's border guards were last week jailed in Iran after crossing over the border, apparently by mistake. The Kabul government handed over some Iranian intelligence officers they had previously detained in order to get their border guards released, the source said. Earlier this year, it emerged President Hamid Karzai's government had been receiving bags of cash from Iran. The US voiced concern about the donations, but analysts said a number of foreign governments were running what amounted to slush funds for Afghan officials in an effort to court influence.